A Look at The Walking Dead- Season 4, Episode 12: “Still” | What Else is on Now? After a few weeks of watching several plots play out at once, The Walking Dead focuses this week on a single storyline: in this case, the continuing adventures of Beth and Daryl as they try and continue their travel after the prison assault. The two together make an odd pair, and while there are some moments of character development that I enjoyed this week, Beth’s overall characterization kept me from enjoying this episode as much as I would have liked to. 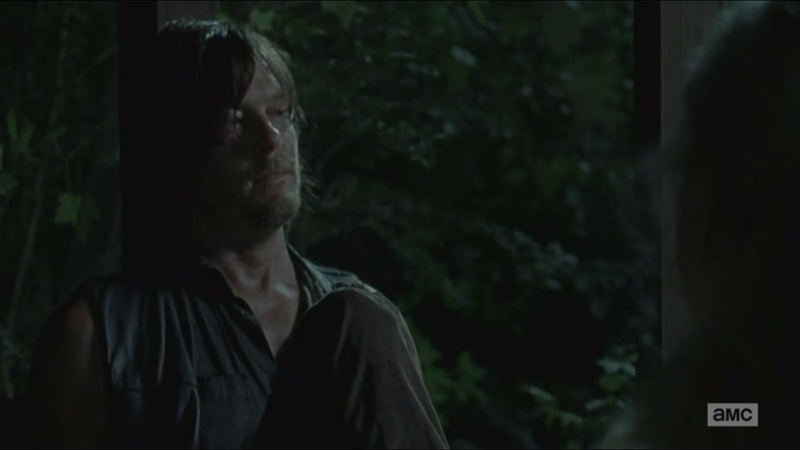 The episode begins in darkness as Beth and Daryl emerge from the woods and happen upon a car. Upon hearing the sound of walkers, the two scurry into the car’s trunk, which must have been quite large to accommodate them both, and wait in silence as what sounds like a mini herd of walkers passes them by. Day arrives and the two emerge from the car before continuing along. Eventually, they create a makeshift camp, with Daryl trying to kill squirrels and snakes, while Beth makes a fire. But Beth doesn’t want to eat snake. She wants a drink. As in an alcoholic beverage, she clarifies. She never had one due to her father, but since he’s no longer around, Beth wants to go find some. Daryl doesn’t argue against it. In fact, he doesn’t say much of anything- his focus is on eating snake. Though she’s almost caught by walkers, Beth returns to the camp and basically says ‘Screw you’ to the terrible camp before calling out Daryl’s lack of emotion. Well, looks like they won’t be singing songs around this camp, then. The two end up at the Pine Vista Country Club. Because, hey, golfers like to booze it up, too, right? Inside, Beth and Daryl find nothing but walkers: some dead and some hanged, but alive. Despite it probably being worthless, Daryl loads a bunch of money into his bag. Why? Because Daryl wills it, I guess. There are walkers a-knocking, so Beth and Daryl move deeper into the club. 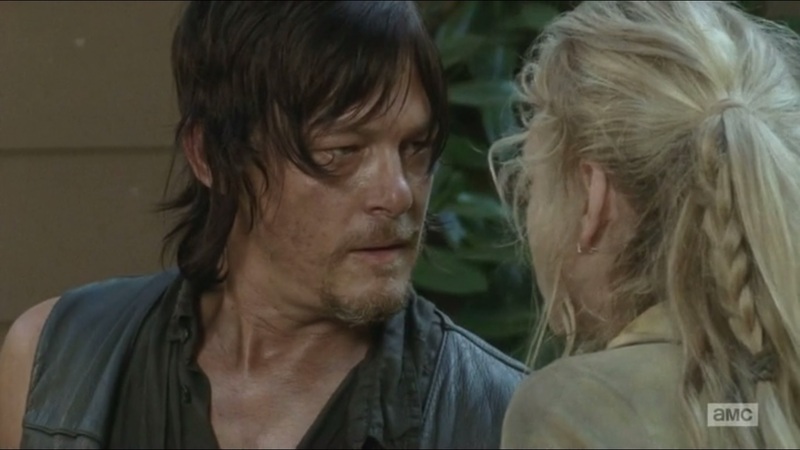 Beth happens upon a walker and she’s able to subdue it, but not without berating Daryl for not helping her. Hey, lady, you handled yourself just fine. I mean, not like Daryl’s trying to be your chaperone. Deeper into the club, a clock goes off and attracts more walkers. Daryl’s able to hold them off until he and Beth are able to rush into the club bar. And the first drink Beth happens upon is Peach Schnapps. Probably not even worth drinking, but screw it. Beth says she needs to do this, even without a glass. Daryl pays her no mind until she begins to cry. His response? Smash the bottle and declare that if she’s going to have her first drink, it sure as hell won’t be Peach Schnapps. 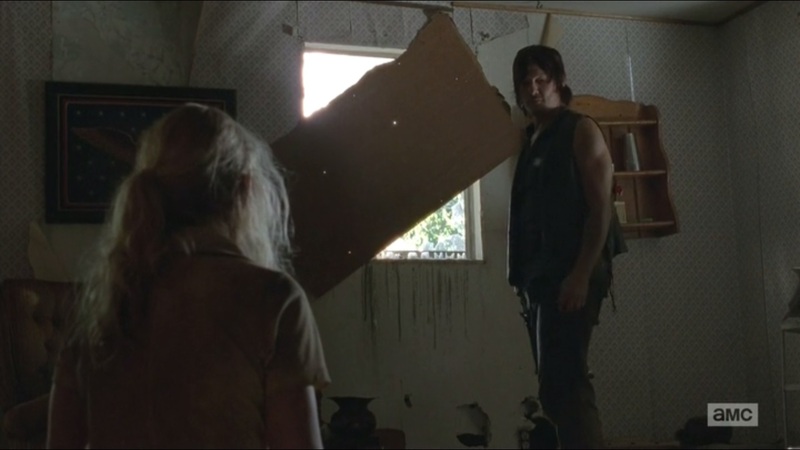 After leaving the club, the two end up at an old home that Daryl once found with Michonne. They head inside and decide to talk while drinking not Schnapps, but good old Moonshine. Well, Beth does most of the talking and drinking since Daryl has to be the sober one. So what is Beth to do now? How about a game? She’ll say something she’s done, and if Daryl did it, he has to drink. Sounds a bit too much like “Never Have I Ever,” but with Moonshine. So we learn that Daryl has never been out of Georgia or been camping. Hey, the camp site in Atlanta had to count for something, you know. But the game takes a serious turn when Beth assumes that Daryl, based on his appearance, spent time in prison. Turns out he wasn’t even a guard. There goes that assumption. And there goes any more quiet, as Daryl begins to rage at Beth. She fires back, claiming that Daryl treats her like a kid, but he never relied on anyone for anything! The only way to break up this argument is with a crossbow. Daryl takes Beth out of the house to teach her how to shoot an arrow at walkers. It’s all done out of rage with the two yelling at each other. Beth claims that killing walkers shouldn’t be fun. She and Abraham probably won’t get along that well. Beth continues to argue with Daryl. She remembers his reaction upon finding Sophia back at the barn. She remembers the helplessness not just from Daryl, but everyone there. And then it all pours out as Daryl lets what feels like so many repressed emotions. He was unable to save Hershel. The Governor came knocking at their door and he couldn’t do anything about it. And, probably for the first time since killing Merle, Daryl cries. But this time, Beth is there with him. Sometime later, the Moonshine has settled in. Not realistically for a first time drinker, but I digress. Daryl shares about his life before the apocalypse hit: he just wandered from one fix to the next, doing whatever Merle told him to do. The two brothers just drifted without direction. Similar story with Beth, who felt Maggie just bossed her around. She speaks of what would have been her future, but obviously that didn’t come to pass. But Daryl, whose used to things being ugly, is used to the hand he’s been dealt. And in what’s probably the most sitcom-like moment of The Walking Dead, Beth and Daryl set fire to the home. They give the burning building the finger before heading off in search of more hilarious Moonshine misadventures. So after spending just a little bit of time with these two in “Inmates,” Beth and Daryl, quite an odd pairing, get our full attention this week. And for me, the results were mixed. For the good, this episode allowed Beth and Daryl to vent their frustrations at the world around them. They recognized their helplessness in the face of the Governor’s assault. Slow growth and character development is a plus, yes, and by episode’s end, the two connect more than I initially thought. The direction for this episode and the horror elements were very well done. The two hiding in a car trunk as walkers pass them by in the middle of the night creates an effective image of being trapped with literally no way out. And it’s all done without saying a word. In fact, the first nine or so minutes of the episode have no dialogue. Instead, the story is allowed to play out through the actors’ facial expressions and actions. I know I say this a lot, but letting the actors dictate the cuts and scenes is much better than having them spelled out for the audience. And for an episode that dealt with very serious themes, there was plenty of humor to be had, such as Daryl telling Beth that her first drink wouldn’t be Peach Schnapps, teaching her how to shoot an arrow when she doesn’t want to and using a golf club to lay waste to a walker. That doesn’t mean all the humor worked, such as Beth wondering whether golfers like to “booze it up.” Ugh, just move onto the next scene already. Beth and Daryl are completely opposite. Beth is too optimistic, whereas Daryl is more realistic. This episode grounded them, but revealed their flaws. Before the world went to hell, Beth lived a sheltered life under Hershel’s watchful eye. She felt that Maggie bossed her around, but she still had a good life. Now that she’s lost her father, she’s surviving and ready to prove that she has what it takes to live through this apocalypse. But Daryl was just a drifter who followed Merle’s every move. He didn’t have much, but he’s now seen as one of the most integral parts of the group due to his survival instinct. Daryl does bury his emotions, yes, and if you asked someone who wasn’t an avid follower of The Walking Dead to name something about Daryl, they would probably just tell you that he’s the guy who uses a crossbow. Nothing else. As a character, Daryl hasn’t been given much screen time to define himself. He’s had his moments, no doubt: being one of the few people on the farm to constantly search for Sophia and the absolute anguish on his face when he has to kill his reanimated brother. Daryl’s had time to develop, but he’s mostly known as the muscle and being one of Rick’s right hand men. This episode allowed us a look at what happens when Daryl feels useless. He blames himself for what happened at the prison, even if there was nothing he could have done about it. This week showed that Daryl, as cynical and distant as he tries to be, does, in fact, care about the members of his group and he’d do anything to protect them. Despite his tough exterior, Daryl has a heart. The episode helps shatter any preconceived notions have of Daryl being completely ruthless and heartless. This is exemplified when he clearly takes offense to Beth assuming that he’d spent time in prison, where she only judged him based on appearance. So with so much positive growth, one would think there’s little to dislike about this episode. For many, there isn’t, but for me, it all falls on one thing: the writing. I’ve said before that one of the strengths of The Walking Dead isn’t when the characters are killing zombies, but when it’s just a few characters talking about their situation. In this case, what kept me from enjoying this episode was Beth’s characterization: I found her entirely too dependable and, for lack of a better word, whiny. She changes by episode’s end, yes, but between this and “Inmates,” most of what Beth has done is just complain about her situation instead of trying to figure a way out of it. She chastises Daryl for not helping her with a walker she managed to take care of herself, but then sarcastically refers to him as a chaperone. She acts as if she’s entitled to have a drink and that nothing else is important at the time. I’m not calling Beth spoiled, I’m calling her a child who makes a lot of unfair assumptions. Characters like Carl, Lizzie and Mika are much younger than Beth, have seen their share of tragedy and walk through this world ready to take it on, but not Beth. I don’t hold all characters to the same set of standards, but I do hold them to, well, standards, and this episode didn’t make me any more interested in Beth as a character. It’s a fair argument to say that Beth lived a sheltered life, but we’ve known Beth for pretty much the same amount of time that we’ve known Maggie, whose shown to have the survival instinct. Look, not every female character on The Walking Dead is going to be Maggie or Carol or Michonne. Heck, Carol started out as completely dependent. The death of Sophia helped mold her into the confident woman that she is now. Michonne had to deal with killing Andrea, while Maggie had to witness both Lori and Hershel’s deaths. Beth did as well, but in my opinion, nothing really defines her outside of being the blonde in distress that needs to be saved. By the end of the episode, she shows that she’s ready to take the world head on, but I’m still not interested in her arc. I also wish there was a better way for her to get Daryl to open up outside of pestering him with questions. I know there are many people who came out liking this episode for what it did for both Beth and Daryl’s character development. There are elements in “Still” that I enjoyed: the atmosphere can be tense, the conversations engaging and the dark humor just as enjoyable as it’s always been. However, the shoddy writing and Beth’s characterization kept me from enjoying this episode as much as I’d like to. Good idea, but shoddy execution. Also, I’ve never had it, but I’m pretty sure a first time drinker wouldn’t be able to down moonshine as easily as Beth did. This entry was posted in The Walking Dead and tagged Alanna Masterson, AMC, Andrew Lincoln, Beth Greene, Bob Stookey, Brighton Sharbino, Carol Peletier, Chad L. Coleman, Christian Serratos, comic book, Danai Gurira, Daryl Dixon, Dr. Eugene Porter, Emily Kinney, Glenn Rhee, Josh McDermitt, Kyla Kenedy, Lauren Cohan, Lawrence Gilliard Jr., Lizzie Samuels, Maggie Greene, Melissa McBride, Michael Cudlitz, Mika Samuels, Norman Reedus, Rick Grimes, Rosita Espinosa, Sasha, Sergeant Abraham Ford, Sonequa Martin-Green, Steven Yeun, Tara Chambler, The Walking Dead, Tyreese, zombies by omarid513. Bookmark the permalink.